2   """Given the data fit the data with your model and return the model (a vector)"""
4   """Given a set of data and a model, what is the error of using this model to estimate the data """
5 ## Copyright (c) 2004-2007, Andrew D. Straw. All rights reserved. 12 ##       notice, this list of conditions and the following disclaimer. 17 ##       with the distribution. 21 ##       from this software without specific prior written permission. 33 ## OF THIS SOFTWARE, EVEN IF ADVISED OF THE POSSIBILITY OF SUCH DAMAGE. 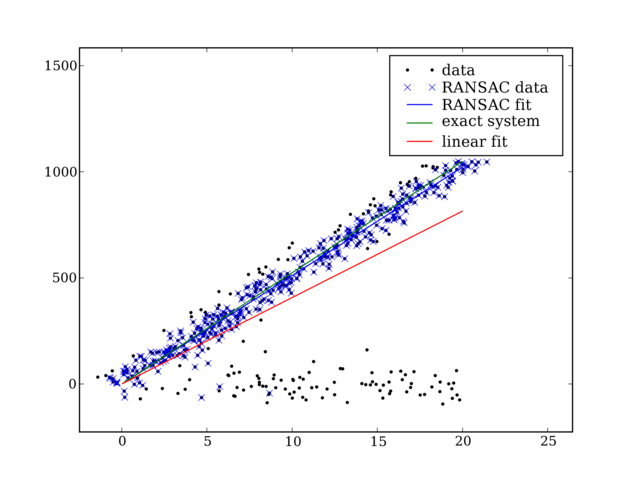 113     """return n random rows of data (and also the other len(data)-n rows)"""
124     needed by the ransac() function.